Okay, last one for now. 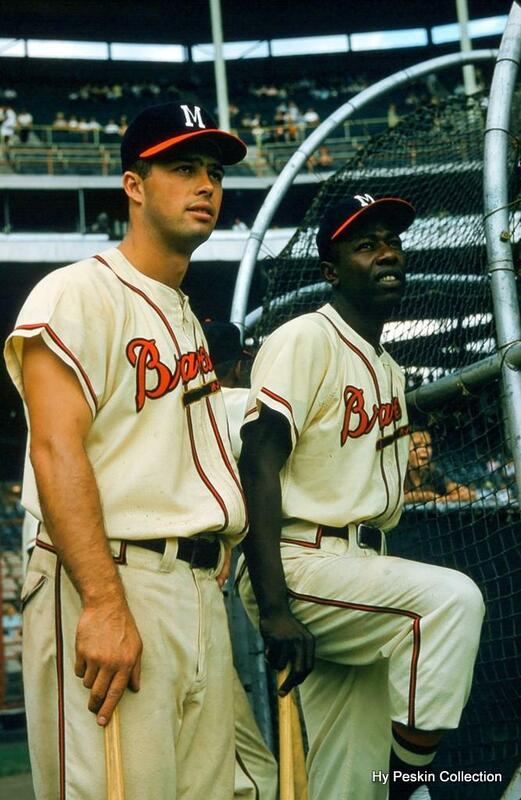 Two for the price of one, Sunday, August 18, 1957, Eddie Mathews and Hank Aaron wait their turn at the cage prior to a game against the Cardinals. Actually, they played two that day – Mathews hit a home run in the first inning of the first game during a 3-9 day, but Aaron went an uncharacteristic 1-9, as the Braves dropped both games against the second place Cardinals (Stan Musial won the first game in the 10th with a 2-run blast). Milwaukee certainly earned a pass though, coming off an 18-3 stretch going into the day, picking up 8 games on St. Louis in the process, and after the double defeat the Braves still had a commanding 6 1/2 game lead, and would take the NL pennant by 8 games over St. Louis; they would go on to win Milwaukee’s only baseball championship to date.